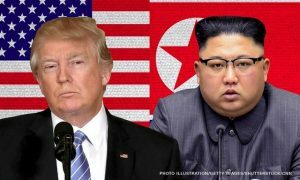 This is well worth a read – for its commentary on the Trump/Kim conference from a Singaporean viewpoint. Not the Singaporean viewpoint that was shouting out “we love you” to Kim Jung-Un but the Singaporean viewpoint from a strict authoritarian state. “I thought I would be indifferent to this clown show that’s come to town- a meeting between two egomaniacs, each one using Singapore as a base from which they will project fantasy versions of themselves. Trump as Nobel Peace Prize-coveting foreign policy dealmaker, Kim as important enough to have a tête-à-tête with the US President. There’s a domestic audience that both are maniacally mugging for, and of course they would be most comfortable in an environment not only manicured and frictionless, but where any form of dissent will have been weeded out by a pliant, obsequious host. No protests, no marches, no turned backs; instead they are treated to wefies and an early birthday cake–all the better to forget that one is a p*ssy-grabbing white nationalist demagogue and another a Stalinist dictator who has ordered the execution of his political enemies by firing squad (and the occasional flamethrower). Online, roving commentators insist that one should be ‘proud’ that Singapore is hosting the summit. But I can’t help but ask, ‘proud of what, exactly?’ It’s not as if Singaporeans are involved in the arbitration or diplomacy, like the peace-building efforts that the Norwegians undertook in Oslo (between the Sri Lankan Government and the Liberation Tigers of Tamil Eelam) or Finnish officials in Helsinki (between the Indonesian government and the Free Aceh Movement). Of executing the logistics for the event? But if they were given a 20 million dollar budget, are we to believe that none of our neighbouring countries could pull off something similar? (And if we really think so, then obviously we have been overdosing on that Kool-Aid called ‘Singaporean Exceptionalism’). Didn’t sound so objectionable back then, right? Except that now not only potential terrorists are screened, but those carrying loudhailers, spray cans, or flags measuring 1x1m will also be prevented from entering the zone. A Potemkin village is a fake portable village built solely to deceive others that a situation is better than it really is. (Grigory Potemkin had them constructed to impress his lover Catherine II when she visited Crimea). There must be a term for this type of gated mirage populated by Stepford Singaporeans, where those who cannot be trusted to “put on a good show” are turned away at checkpoints which have mushroomed overnight. Shall we call such an area a ‘Singapore Special’?